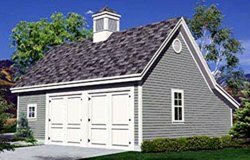 If you are planning on building a garage, there are TONS of detached garage plans out there. Most of them cost hundreds of dollars for a set of blueprints to build a single design. There are some places that sell them for less, but I have not been impressed with the level of detail in them. I'll be honest, when I ran across this package of 58 different garage blueprints for only $29, I really didn't expect much. But for that amount of money, I decided to bite the bullet and buy it to see what they were like. I have to say I am pleasantly surprised! Almost all of these blueprints are very detailed and complete. A large number of them come with material lists. They have foundation details, material specifications, framing details, and how-to notes. 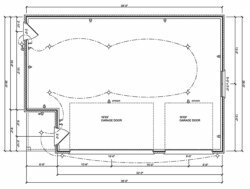 Woodberry: These garage workshop plans have a 20'W x 22'D parking area plus an 8' x 15' workshop on the side, making it L-shaped. The building is 28' wide overall at the front. It is a post frame structure with a storage loft overhead. These plans include 4 pages of how-to notes, material specifications and requirements, elevations, floor plans, and framing details. 14 pages total. Berrywood: Similar in style to the Woodberry, these plans are for a 24'W x 22'D pole frame structure with the parking area centered in the building. It has the same shed roof on the back side, but the layout is rectangular instead of L-shaped. These blueprints have all the same details as the Woodberry above. 14 pages total. 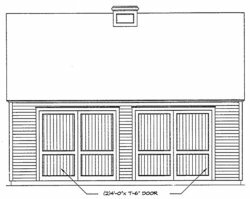 These detached garage plans all utilize a single 8' door and a pair of 30" wide (60" total) swinging doors beside it. This design uses conventional stick-frame construction and pre-engineered roof trusses. Each separate plan set has 40 pages, and includes a material list, material specifications, elevations, and construction details. The 16' deep versions are great as a workshop only or for parking small vehicles, and the 20' deep versions will accept a full-size car, truck or SUV. 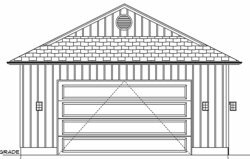 Design # 4: 38'W x 26'D 3-car garage workshop plans. The layout is L-shaped, with a 6' x 8' covered porch inset into one corner. The parking area is 32' wide with a 6' x 18' workshop area on one side. It has a 16' wide double door and a 9' wide single door, plus two entry doors. It is a stick-frame structure with pre-engineered roof trusses. With only three pages, this is one of the plans that comes up short compared to the others. Oakville: This is a very versatile detached garage plan, with 18 different possible layouts. The center section is a 16' wide single bay with a storage loft, and it can be built either 22', 24' or 26' deep. This plan is designed to stand alone, or you can add a 12' wide extension shed to either or both sides. The extension shed can be used as a workshop or an additional parking bay. If you build it with one or both of the extension sheds to start with, you can leave out the wall between the main section and the extension, so you can have a completely open three-car garage. Or a two-car garage with a separate workshop area. Or a one-car garage with one or two workshops. Lots of possibilities here. The Oakville is a conventional stick-frame building with rafters and a ridge board for the roof design. The plan set includes elevations, construction details, and material specifications and requirements. It is 28 pages, plus there are separate material lists for the main building and the expansion sheds in each of the different lengths. Garden Oak: These are my favorite detached garage plans of the bunch!!! The Garden Oak design uses the same expandable concept as the Oakville, but has a 24' wide 2-car garage as the center section. You can build it 24', 26' or 28' deep, and add a 12' expansion shed to either or both sides. These garage loft plans give you more useable storage space upstairs than the Oakville does due to the width. The Garden Oak is also a conventional stick-frame building with rafters and a ridge board, and has a pull-down stairway for the loft. Just picture this one with a door instead of a window upstairs, with a deck over top of the driveway. You could add an under-deck roof system and have a carport in front! 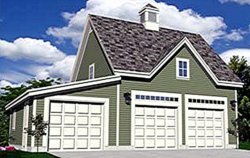 Like the Oakville, this plan set has 18 different possible combinations of garage and workshop bays in the different lengths, and it includes elevations, construction details, and material specifications and requirements. It has 30 pages, plus the separate material lists for the main building and the expansion sheds in each of the different lengths. Oak Lawn: This detached garage plan is similar to the Garden Oak, but the gables are on the sides and it has a third gable on the front. It has a 24' wide center section that can be built 24', 26' or 28' deep, with 12' wide expansion bays on either or both sides. The expansion bays can be built as either a workshop or an extra parking space. It also uses stick-frame construction with rafters and a ridge board. The Oak Lawn includes an option for a full stairway to the storage loft, or you can use a pull-down stairway. Otherwise, this design has all the same details and information as the Garden Oak. The main set of plans is 38 pages, plus separate material lists for the center section and the expansion sheds in each of the different lengths. Design # 8: 31'W x 25'D 2-car garage shop plans with a 16' wide door and a workshop on the side. It has a 3' entry door on the front and 5' wide double doors on one side. It does include a wiring diagram, but at only 2 pages, this is the second set that leaves a little to be desired. Design # 9: 18'W x 24'D, this is a simple gable-end, oversized one-car detached garage plan. It is a stick-frame design that uses pre-engineered roof trusses. The 11-page plan set has construction details, elevations, and includes a material list. Candlewood: 21'W x 22'D garage workshop plans. Pole-frame construction with a storage loft. This one is L-shaped with a single parking bay on the side and a workshop on the front. These garage loft plans include a floor layout, elevations, framing details, and material specifications and requirements. There are 14 pages total, with four pages of how-to notes. 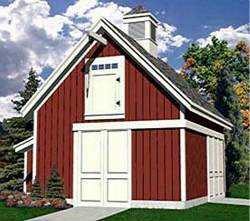 Design # 11: Barn-style 16'W x 20'D detached garage plans, with stick-frame construction and a storage loft. The plan set is very detailed, with 31 pages including elevations, construction details and material specifications and requirements. Design # 12: 28'W x 46'D RV garage plans that have 12' tall side walls with a 10' tall door in front. This design uses stick-frame construction with roof trusses, and has a wiring diagram, elevations and cutaway views. This is the third design that comes up a little short on detail, with only three pages. 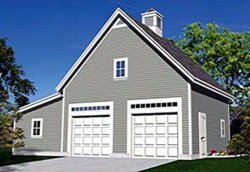 In addition to the detached garage plans listed above, you get lots of links to other garage building resources. Most of the other information is free on the web, but the issue is knowing where to find it all! You will find links to information on everything from foundations to cupolas, plus some free plans and a link to a 225-page carpentry manual! For $29, it's hard to beat the amount of information and the quality of the detached garage plans that you get. Yeah, there are three "duds" in the package, but the rest of the designs more than make up for them. 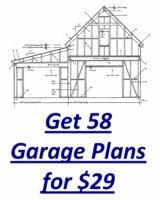 If you are considering building a garage, this package of 58 garage plans is definitely worth the price, and it even comes with a money-back guarantee if you aren't satisfied. 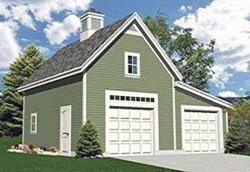 If you are just "poking around" on this site, you may want to take a look at our Related Pages for more information on detached garage plans.